The Place We first visited The Chop House at Vivocity when it first opened in 2015. We were excited with the casual dining concept by the Wooloomooloo Group based in Hong Kong after having tried Wooloomooloo Steakhouse previously at Swissotel the Stamford, with Chop House’s speciality extending beyond the group’s focus as a steakhouse by including other types of meats other than beef on its menu. As with the casual vibe, you get a more relaxed dining ambience with waterfront seats available, boasting views of Sentosa and Resorts World across the straits. The Food The options here come across very much American, with a clear focus on the grilled meats. To enhance its positioning as a casual dining spot, The Chop House also serves a good range of beers and wines to compliment its food menu. To start, we went for the Mussel Mariniere (S$25), a dish simply prepared with white wine and garlic. Frankly, so long as the restaurant is using fresh mussels, it can’t go very wrong. Although admittedly, we found the price slightly high for a casual dining concept. For our mains, we picked the Berkshire Pork Chop (S$33) as I have previously heard good reviews of it. Done with what the restaurant named Mongolian glaze, which is a sauce prepared by mixing hoisin, black bean and chilli sauce together; with the meat served with apple radish salad. It is not often we get to enjoy such tender and juicy grilled pork, hence this is definitely a highlight of our meal. 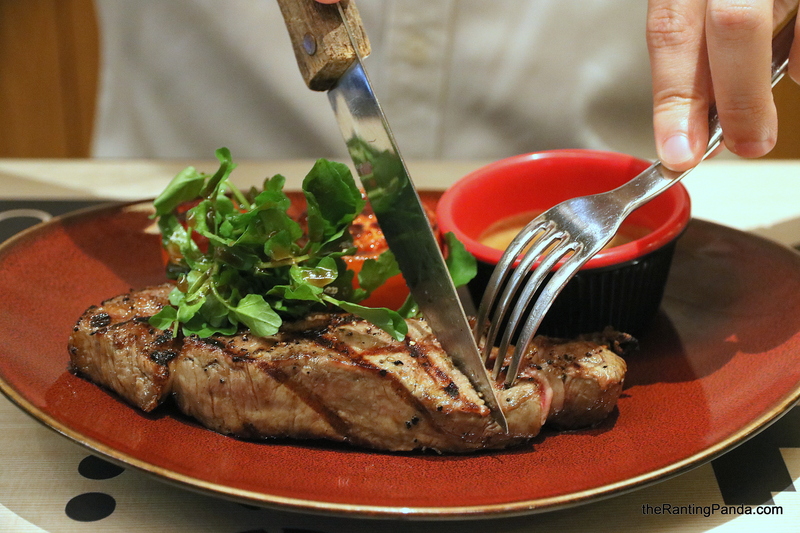 And how could you not have steak at The Chop House, with the USDA Prime Rib Eye (S$39) being our cut of the day. You can have it with a choice of Bearnaise, Red Wine or Black Peppercorn sauce. Done medium rare, the steak was well-executed. If you only have space for one dessert, go for the Sago Gula Melaka (S$7). This is basically a chilled sago pudding with Gula Melaka ice cream and coconut milk, topped with pistachio. The seemingly bland looking dessert packs much flavours, and I wouldn’t have mind another bowl of this extremely satisfying dessert at all. Rants It is hard to define The Chop House’s positioning. It is definitively not the higher end concept like Wooloomooloo Steakhouse. As a casual dining concept, the prices of the dishes are generally steeper than the other casual dining options in Vivocity. Will I Return Again? Vivocity has no lack of dining options. But if you have decided on The Chop House, rest be assured that it would be a satisfying meal.